Preparation and dosage: blend 1 or 2 teaspoonful of the herb into 1 cup boiling water. Simmer 10 minutes. Drink 3 x daily. Tincture: take 1 teaspoon, 3 x daily. The common name translates from the Sanskrit ashva, "horse," and gandha, "smells like," which alludes to the virility of a horse. The species name somnifera indicates that the herb is a soporific agent. Ashwaghanda is native to India and the subtropical areas in the drier regions of the foothills of the Himalayas, at altitudes of up to 5,500 feet. It now grows wild from Europe to North Africa and the Middle East, often along roadsides and in fields. This perennial plant somewhat resembles a stout potato plant but grows as large as a shrub. During its fruiting stage, the auxiliary clusters of yellow-green flowers look like miniature Chinese lanterns. As the plant reaches maturity, the calyxes become transparent, revealing orange-red berries that contain yellow seeds. Root: adaptogen, anabolic, analgesic, anti-inflammatory, antioxidant, antispasmodic, antitumor, aphrodisiac, astringent, diuretic, hormone tonic, hypotensive, immune tonic, nervine, nutritive, rejuvenative, sedative, tonic, uterine relaxant. Leaf: adaptogen, antibiotic, aphrodisiac, deobstruent, diuretic, narcotic, sedative, tonic. Fruit: diuretic. 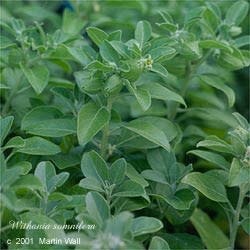 Ashwagandha's use has been recorded for at least three thousand years. It is excellent for those in convalescence. An Ayurvedic maxim says that taking ashwagandha for fifteen days imparts strength to the emaciated body, just as rain does to a crop. The herb has many other medicinal uses, including being of benefit to those with AIDS, alcoholism, anemia, anorexia, anxiety, arthritis, asthma, bronchitis, bipolar depression, cancer, candida, cough, chronic illness, depression, dropsy, dyspepsia, edema, Epstein-Barr virus, erectile dysfunction, exhaustion, failure to thrive (in children), fever, forgetfulness, glandular swelling, graying hair, headache, hypertension, infertility, insomnia, leukoderma (localized loss of pigment in the skin), low libido, lumbago, memory loss, mental fatigue, miscarriage, multiple sclerosis, nausea, neurosis, overwork, panic attacks, premature aging, rheumatoid arthritis, seizures, low sperm count, stress, tremors, tuberculosis, tumors, and wasting diseases. Ashwagandha is believed to maintain the immune system and is often prescribed in India to be taken along with antibiotics to prevent weakening of the immune system. It elevates iron levels in the blood, slightly decreases respiration, lowers blood pressure, relaxes smooth muscles, and, due to its flavonoid compounds, counters liver toxicity. It works as a monoamine oxidase inhibitor, thereby increasing the availability of dopamine, a neurotransmitter. It also appears to mimic the action of the neurotransmitter GABA (gamma amino butyric acid) in relaxing the body. It is known as a medharasayan remedy, "a promoter of memory and learning." A poultice of the leaves can be applied topically to reduce tumors, treat wounds, expel worms and lice, lower fever, and soothe boils and sore hands and feet. An oil infusion prepared from the plant can be used to ease a sore back. The plant has a flavor somewhat similar to that of unsweetened chocolate. Tea prepared from the plant is often flavored with spices such as cinnamon, cardamom, ginger, nutmeg, and milk. Ashwagandha powder is sometimes mixed with honey and almond butter or ghee and served on crackers. The seeds have been used in place of rennet to curdle milk for the making of cheese. The leaf is used as an insect repellent. The fruit, which is rich in saponins, is sometimes used as a soap. During pregnancy use ashwagandha only under the guidance of a health-care professional, as there have been some reports of the herb having abortifacient properties. Using this herb in combination with barbiturates can exacerbate their effects. The berries have caused gastrointestinal distress when consumed by children. Do not use the leaf in cases of congestion.